Lippy Lucie: Becca London Nail Masterclass Excitement! Hi guys and dolls! I have been MIA for ages.. posting snippets here and there.. this is due to studying for my nail tech course and also the weather here is really not motivating me to create anything on my nails of late!! Wahh! Anyhow I thought I would let you know about an exciting little class I am taking this coming Saturday 19th May. I read about the class on Alice's blog Super Gorgeous and it looked like something I could really benefit from and also enjoy!! Alice has some great pictures of her experience there so check that out if you're interested in going! 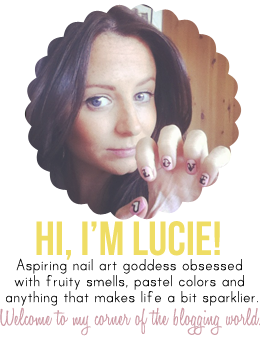 So the class is with Becca London and we are to be taught by Nail Goddess Katie Jane Hughes. The aim of the class is to teach how to perfect the DIY manicure, how to make it look professional, nail art and nail trends. Although this is something I already practice I think I will definitely benefit from a few tips and pointers and also some ideas for new nail art designs. You also get a FREE Becca nail polish in a colour of your choice when attending! The master classes run on Saturday 19th May at 10am-2pm or 3pm-7pm for £85. Email joanne@beccacosmetics.com for more info. Are any of your bloggerrettes attending? !